As Evar Hecht opens a cabinet in his workshop, sandals in multiple sizes and styles tumble to the floor. There’s a brown leather pair, size 18, the biggest Hecht’s ever made, for a man in Texas. A black pair features a half-inch lift on one heel to correct a woman’s orthopedic imbalance. Yet, what all of these sandals have in common is that they were crafted from high quality, domestically sourced leather at Hecht’s Asheville shop, Paul Taylor Custom Sandals & Belts. In 1995, Paul Taylor, a master sandal maker of 30 years, moved from Michigan and set up shop on Wall Street. When Taylor decided to retire in January 2010, Hecht, his apprentice of two years, agreed to buy the store and carry on the tradition. 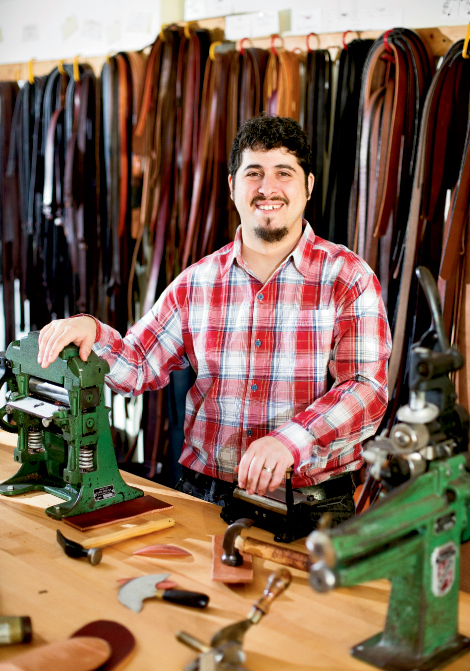 Leatherwork is a historic, yet dying craft. “At the turn of the century, cobblers were the largest employers in the country, making shoes for the entire town,” Hecht says. With the rise of mechanization and manufacturing moving overseas, he estimates only 20 to 30 handmade-belt shops and fewer than 10 custom sandal stores remain in the United States today. “Ultimately, I hope we can start training more people in the art of sandal making so we can bring manufacturing back to the United States and provide more jobs in Western North Carolina,” he says. Like Taylor, Hecht is passing on the craft by working with apprentices. Customers can choose between seven sandal styles made with hide from Horween Leather Company in Chicago or Hermann Oak Leather in Missouri, two of the oldest sources in the country. Hecht hasn’t strayed from Taylor’s 90-step process. Each customer’s feet are precisely measured and traced. A pattern is then cut from plush, saddle-grade leather, accounting for foot arch. The footbed is then attached to a Vibram sole and straps are assembled and aligned with the client’s measurements. Using vintage machines, including a 1930s sole splitter, Hecht assembles the one-of-a-kind shoes. “Paul taught me you have to take your time because if you don’t size the sandal right to start, the customer is going to come back until it’s right,” he says. Hecht has also grown the business, offering handbags, wallet chains, baby shoes designed by his wife, Rebecca, and more than 5,000 vintage buckles to complement the selection of leather belts. Customers can order by phone or online using a sandal-by-mail kit, which includes samples of footbed and strap colors and soles. Each pair, which start at $300, comes with a two-year warranty for fit, comfort, and wear.